I’m confident that when people first hear the word wallpaper their initial reaction isn’t that of excitement. But gone are the days of humdrum textured paisley prints – wallpaper has opened up a new world of possibilities and, with a little bit of adhesive know how, instant wow factor. Binny Talib is a talented Sydney-based illustrator whose art graces products all over the world including clothing, books and greeting cards. This year she launched her very own wallpaper collection which will have you mesmerised by its funky attitude. Bear With Me is rocking the neutral vibe which I think is fantastic since it’s a popular unisex-friendly decorating option for a nursery. The neutral background has bears with snazzy neck ties and striped attire for a hint of colour. If bold is more your style, then cast your eyes over the Lazy Bones design in white, teal and red that’s perfect for either boys or girls. The banksia-like flowers aren’t obviously floral to the point of people questioning your taste and you can’t help but smile at the characters lazing on toadstools and flowers. Binny has many, many more fabulous designs to choose from, including the peaceful and serene blue grey Pups In Cups and the gloriously pink Swirly Girly. 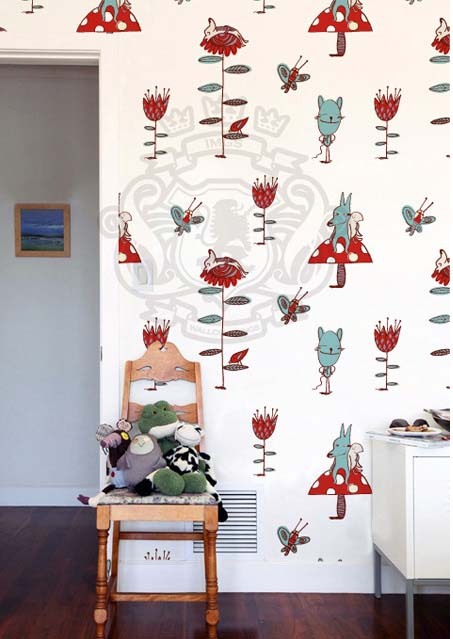 All wallpapers are available right here in Australia for $350 per roll. A feature wall would be pure luxury – a fantastic DIY project could be wardrobe door inserts using Binny Talib wallpaper! To see the whole range head on over to Imgs Custom Wallcoverings. Delivery to your door is absolutely no hassle.